native to the margins of the Caspian Sea. It attains 30 m tall. Similar leaves to that of the chestnut, but with pubescent underside , and smaller (10 cm). Its blossoming is earlier that that of the chestnut (it is in May, that of the chestnut in summer). Oak of Lebanon: its flowers with long filaments are precocious (at the end of March). It also has toothed leaves as those of the chestnut. It attains 20 m.
Origin: Japan, China (hardy oak). Deciduous leaves, but falling late in autumn; oval, tough, top shining in vein salient median, squalid green underside; 7-15 cm long. Fruit: elliptical acorn with conical apex, of 2 cm long, fitted tightly round in the third in the cupule endowed with annuluses with scales and silky hair. Smooth, brown-grey bark, with fine orange cracks. It resembles the bark of the beech. 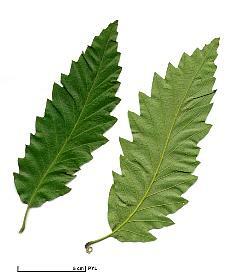 Persistent leaves, lanceolate, acuminate apex; dark green top, lustrous; very discreet teeth; 7-12 cm long. Fruit: ovoid acorn, fitted tightly round in the third in the cupule endowed with annuluses with scales. It does not attain his full maturity in Europe. Utility: its leaves are appreciated by silkworms. Attempts at raising silkworms in Europe with this tree have failed (just as with tree of heaven).